If you reside in Miami Beach or Aventura areas it is important to select the right contractor when looking to remodel your kitchen cabinets. Condo living requires that contractors adhere to the strict rules set forth by condo associations and therefore the selection of the right kitchen remodeling contractor can eliminate wasted time and effort. When remodeling your kitchen and/or bath cabinets, in Florida, it is not a requirement for potential kitchen remodeling contractors to hold a license. This is as long as the work to be completed involves the remodeling of the kitchen cabinetry and/or bath cabinetry. A company that focuses on the manufacture of kitchen cabinetry can complete the remodel of your kitchen, including installation of a granite or Quartz countertop, and the re-connection of the existing plumbing, granted they hold a certificate of liability insurance. Most condo associations or HOA’s, require a minimum liability insurance of one million dollars. A contractor will also be required to submit a Worker’s Compensation Certificate or a signed waiver may have to be provided by the owner. As the owner of the condo, it is important to keep communication between the association and contractor clear and concise. Most associations will provide their condo owners with a packet that include detailed instructions of the requirements needed before they allow the work to begin. Costly mistakes can be avoided by simply keeping the communication between the HOA’s, owners, and contractors transparent. A reasonable time table should be allowed to give the contractor time to submit the required documentation to either you or your condo association. 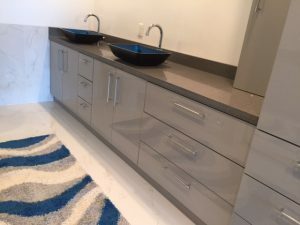 The success of your project, especially if you live in restricted areas like Miami Beach or Aventura, begins with gathering information about the potential cabinet remodeling contractor, hiring a contractor who has the right qualifications to complete the remodel, and healthy communication, between all of the parties involved.